Have you always loved the look of custom leather? Leather products are some of the most durable fashions that are available, but they are also some of the most difficult to create. It is a thick, resistant product that doesn’t like having a needle stuck into it, much less a complicated stitching pattern! However, if you’ve got the best sewing machine for leather working with you, you’ll find that custom leather products are fun and easy to create! How can you find the best sewing machine for leather that will meet all of your needs? The chart below is a great place to start! The top products in this category can be quickly compared so that you can find the best equipment possible right now. Why Is a Leather Sewing Machine Needed? The one real problem that there is with leather crafting is that you can’t make any mistakes. All it takes is one stitch in the wrong spot and you’ve got a worthless material sitting in front of you. That’s because when you make a stitch in leather, you’re creating a permanent hole in the product! You can’t even use pins when plotting out your project because of this fact. Leather also tends to stick to the presser foot or the throat plate of most standard sewing machines. Although you can sometimes get away with putting a piece of scotch tape over the bottom of the foot, most machines aren’t going to accept the thickness of the material. The leather will either stick underneath the foot or you’ll just get a stuck needle that has created a problematic permanent hole. The best leather sewing machines are also going to provide you with a longer stitch length option. The longer stitches are better for leather because it will provide a stronger, more secure seam. If you’re using a faux leather product, then the same rules apply when sewing this type of material too. When in doubt, use a scrap of the material you intend to use and test out how your sewing machine will react to it. If the sewing machine you have won’t let you sew the materials, then you’re in need of an upgrade to the best leather sewing machine to finish off your project. What Are the Basics of Leather Stitching? The key to a good sewing experience with leather is to watch what your thread tension is very carefully. Standard sewing machines will automatically try to adapt with a tighter stitch and that might cause the thread to break. 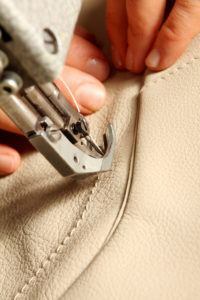 You can under-compensate on a manual machine and cause the stitch to ruin your leather. That’s why having the best sewing machine for leather helping you out is a tremendous benefit. It will take care of this problem for you! Stitching with leather also means needing new needles on a consistent basis. The leather will dull the point of the needle after some time and you’ll end up either breaking the needle, jamming up your machine, or ruining your product – if not all three! Always change your needle before starting a project and when you reach a natural stopping point, change your needle again. You’ll also find more success when trying to sew leather products by using a synthetic thread instead of a cotton thread. Nylon and rayon are typically going to be your best options, but a polyester of upholstery weight can work as well. If your leather won’t slide even with your leather-specific machine, some baby powder can help you other there. Are Residential Sewing Machines Good For Leather Sewing? There are two basic types of leather sewing machines you’ll find on the market today: residential sewing machines and industrial sewing machines. Residential machines are an all-in-one unit that will allow you to sew some basic leather projects. Most of these machines will handle a leather thickness of about 3/16” when you use the proper leather needles. If you need to sew anything thicker than this, then you will want to invest into an industrial leather sewing machine. This also means you’ll need to have a servomotor, and a table, at minimum with the machine to finish off your project. The advantages of upgrading to an industrial machine give you some additional options for all of your projects. The maximum stitch length is upgraded from 4-6mm to 8-10mm. Stitching speeds can reach upwards of 2,500 stitches per minute. You don’t need to take breaks while sewing to allow your machine to cool down. Purchasing an industrial sewing machine is a commitment. Unless it comes with an automatic lubrication feature, you’ll need to oil the components of your new machine after every session. You’ll also need to oil it after a few days of it not being used. Residential machines are great for light leather projects. If you have a number of thick leather products to sew, then invest into an industrial machine. If you just have a couple of projects that you want to get done right now and that’s it, then hand-sewing your leather might be the most cost-effective method. Just be aware that it’s a slow and tedious process. How Do I Find the Best Sewing Machine For Leather? The first stop on your shopping journey should be one of our best sewing machine reviews. These reviews are designed to help you sort out what makes and models can meet your leather product needs. You can quickly find the features and advantages that will work for you and then eliminate machines or choose to purchase one based on the information that you see. You’ll also want to take a look at the strength of the needle that a machine can accept. Although most needles will work for leather when the point is sharp enough, there are some machines that have a thin standard needle that won’t work very well. Look for stitch adjustments as well so that you can maximize the strength of your final leather product. This is a dial command on lower end models and a push-button feature on upper end models. Some sewing machines don’t always like to accept synthetic threads either. If they do, then you may need to use a vertical spool instead of a bobbin in order to achieve the right results. Look for this option in particular if you’re wanting a leather-specific sewing machine and you’ll be able to create stunning items – even ones that aren’t leather based! If you’re just planning on using thin leather or faux leather for your next project, then you could get away with using a standard sewing machine if you use the tips included here. If that is the case, then you can expect to pay around $250 for an entry-level machine that has a high enough quality. For thicker leather products, you’ll need a machine that has more heavy duty features. This will increase the costs by at least 25%, if not more. The average price for a sewing machine with a fair amount of features and a high footer is generally around $500. Top of the line sewing machines that can handle leather will top out at $1,500 or so on a website like Amazon. Your local dealer may have a 20% upcharge or more on any of the prices that are listed here, so keep that in mind as you shop! The Janome HD3000 is built to sew leather. Don’t be fooled by the plastic case and automatic functions that come with this machine. It will easily sew leather, canvas, and other heavy duty materials with ease. Quilting, tie blankets, and even products with up to 6 layers of cotton materials can quickly be sewn together thanks to the effectiveness of this machine. If you’re ready to have sewing become fun once again, then let this sewing machine become the last one you may ever own. As with any leather project, you’ll need to make sure you’ve done all of your fitting before you get started. Once your fresh needle makes a hole in your leather or faux leather materials, that hole is going to be permanent. The Janome HD3000 gives you enough space to use clips or tapes as you’re sewing to keep the materials together as your project takes form. You’ll need to replace your needle on this machine once you’ve finished the project, as you would with any other machine. For features, the Janome HD3000 is rather simple as it offers a reverse stitch leverl, a built-in needle threader, and foot pressure adjustments. This corresponds with 18 stitches and a one step buttonhole feature. You’ll also receive a hard case cover so that you can safely store your new sewing machine for leather when it isn’t being used to create something magical. If you need to sew leather, then you need a heavy duty sewing machine. The Janome HD 3000 is ready to step up for the job. Click here to look at pricing on Amazon and buy now on the Janome HD3000. Many sewers recommend that you hand-sew your leather projects. This helps to eliminate the potential errors that may occur when a misfeed occurs within the machine. For the average sewing machine, that’s pretty good advice. If you own the Sailrite Heavy Duty Ultrafeed LSZ-1, however, you might just change your mind. This sewing machine can easily go through 10 layers of canvas, so even if the tanning process has left your leather feeling a little thick and sticky, you’ll still be able to power through your project with ease. In many ways, this sewing machine has commercial qualities built into it so you can quickly sew any leather project together. You will need to purchase a separate needle for leather with this machine from Sailrite. Do not use the included needles as they will not properly puncture the materials to create an effective stitch. As long as you use accessories that are designed for the materials you’re sewing, from leather to Dacron, you will find that this machine has the capability of creating a stitch length of up to 6mm forever. Setting up the sewing machine is also quite easy thanks to the full-color guidebook that is included. Whether this is your first time with a sewing machine or you want a dedicated sewing machine for leather, this could very well be one of the very best overall sewing machines on the market today. Try it for yourself and you’ll love it as much as we do – if not more. Click here to look at pricing on Amazon and buy now on the Sailrite Ultrafeed® LSZ-1. It’s got 600 built-in stitches. There are 13 styles of fully automatic one-step buttonholes included. You’ve even got 5 different fonts of which to take advantage for your custom embroidery projects. The Singer 9960 Quantum Stylist even has stitch editing capabilities which allow you to control the exact location of your preferred stitch pattern. Needless to say, this sewing machine offers a lot of value for a competitive price. As for its ability to stitch leather effectively, the automatic needle threader and top drop-in bobbing system allow you to setup the machine pretty easily. As long as you change out your needles and take your time, you’ll find that the results which can be achieved with this machine are better than the price might indicate. There are some features included with the Singer 9960 Quantum Stylist that work better for materials other than leather. 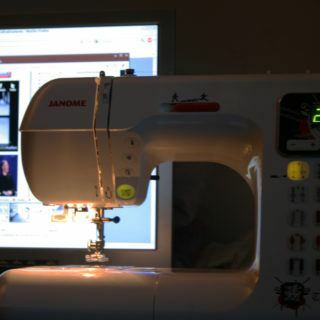 The electronic auto pilot, for instance, includes speed controls which can make other sewing projects be a lot easier to complete and still be free of errors. We also love the automatic threat cutter that trims the upper and lower threads with one-touch once you’re done so you can just move onto the next task. With a larger than average sewing space and a helpful walking foot, this sewing machine can help you get your leather project completed in no time at all. For those on a tight budget, we highly recommend this option when needing the best leather sewing machine possible. Click here to look at pricing on Amazon and buy now on the Singer 9960. This sewing machine is made in the same factories that Toyota uses to make its vehicles. Instead of a plastic interior, you’ll receive a heavy duty metal interior body instead. Combine this with the 25 stitch functions that are available, including a 1 step automatic buttonhole, and you’ll be able to create custom leather projects with ease when you’ve got the right accessories helping you out. The size of this particular sewing machine could be problematic for larger leather projects. You’ll have to bunch up the leather to reach certain hems and that sometimes isn’t possible if the materials are thicker or more resistant because of how the leather was tanned. This Toyota sewing machine tends to work best for the smaller projects you have. What we really liked about this sewing machine was the amount of heft that it has. If you’ve used some of the other sewing machines at this price point, their lightweight nature tends to make them vibrate and move as you’re sewing and that can throw off your stitching rhythm. The Toyota FSG-325 is rock solid, letting you power through leather, quilt accurately, or finish your sewing chores with a professional look. If you’re looking for an affordable sewing machine that can take on tough tasks, yet still have its lifespan measured in decades instead of months or years, then you’ll want to give this sewing machine a test drive today. Click here to look at pricing on Amazon and buy now on the Toyota FSG-325. Leather projects come in all shapes and sizes. The Janome Sewist 500 is going to be able to handle the thinner leather materials that you’ll want to sew. Fixing a handle on your purse or saving a wallet is something this machine can handle pretty easily with the right needle. If you want to stitch a leather coat or complete a custom project of a larger size, then you may find that the size of this machine limits your ability to get the job done. The cost of the Janome Sewist 500 makes it an attractive option. It’s plastic case might leave you doubting its durability at first, but the quality of the output this machine produces will quickly change your mind. How you use the foot pedal is what will ultimately determine how successful this machine will work for you. Here’s the deal. As you tap on the pedal to line up your next stitch, the gears within the machine tend to grind together and this makes a loud sound that we’d describe as “crunching.” If you need to consistently use the foot pedal stitch after stitch, this can wear out the gears prematurely. Otherwise you’ll find that the Janome Sewist 500 is a rather powerful machine that has the ability to take care of virtually any project you have, including leather. We were satisfied with the performance of this machine and are confident that you will be as well, whether you have been sewing for years or if this is the first time you’ve ever purchase a sewing machine. Click here to look at pricing on Amazon and buy now on the Janome Sexist 500. Most sewing machines that can handle leather will give you a maximum stitch of 5-6mm. The Consew 206RB-5 heavy duty sewing machine doubles that, giving you an extra long stitch of 10mm instead. You’ve also got a tread release finger for the heavy threads you might need for your leather project and you can even remove the bobbin without removing the materials that are being sewn. As long as you’ve got the right needles, you’ll find that this sewing machine will get the job done for you. This is an industrial sewing machine, so it isn’t going to function properly without a proper table and a motor to help you with the operation of the machine. We recommend using a motor that can handle variable speeds so you can take advantage of all the features this sewing machine is able to provide your leather project. Once you do, whatever the amount of leather you can fit underneath the pressure foot is going to get stitched. It’s also important to oil this machine after every use so that it can maintain its functions. If you don’t use it for a couple of weeks, you’re still going to need to oil it. As long as you are proactive in taking care of the Consew 206RB-5, it is going to take care of any project that you need to get done. It is a bit of an investment at this price point, but it will definitely be the last sewing machine you’ll need to purchase for any project you may have. Click here to look at pricing on Amazon and buy now on the Consew 206RB-5. With a single straight needle, the top and bottom feed is specifically designed to make sure you don’t have slippage between different layers of material. That is particularly important for leather projects since one slip is all it takes for your project to be completely ruined. It comes with the M style bobbin and a wide table that will accommodate a vast majority of your projects. That’s just the start of what the TacSew Industrial sewing machine is able to provide your home. Many industrial sewing machines today require you to manually lubricate them to keep the gears in proper working order. This model offers a fully automatic lubrication option so your only task is to make sure the reservoir has enough oil to keep you working. Do that and you’ll be able to sew every day for as long as you want without difficulty. You’ve also got some stitch length options that are better than other leather sewing machines at this price point. You have a straight lockstitch of up to 8mm in stitch length and there is a reverse option as well. You’ll need to purchase your weld cord foot separately and you’ll need to get your table and motor separately, but otherwise you’ll find this is a fantastic machine that can get virtually any job done. It’s powerful. It’s fast. It’s designed to work in some tough environments, so it isn’t as “pretty” as some other sewing machines. It will, however, allow you to sew leather like you’re a pro. Click here to look at pricing on Amazon and buy now on the Tacsew GC6-6. This industrial sewing machine comes with everything you’re going to need, including the table and motor that are required. . In return, you’ll receive a machine that can power out 2,500 stitches per minute. You can have a maximum stitch length of 9mm. It’s a straight stitch, walking foot sewing machine and its safety features automatically engage if it detects a problem with the sewing to stop further damage from occurring. Leather projects become easy to complete thanks to the design of this sewing machine. It is a little noisy when compared to other sewing machines that are used in the home, but the sound levels are in line with other industrial machines of this type. It runs on 110v power and works as you’d expect the machine to work. What would we change about this experience? It’s the qualifications that Juki has put on this product. They specifically state that because this is an industrial sewing machine, you might receive a unit that is scratched or dinged, but this doesn’t change the effectiveness of how it operates. For $1,800, you should receive a brand new sewing machine that is taken care of properly. You’re also told that table colors are variable based on current availability. From a performance standpoint, we really enjoy what the Juki DNU-1541S Industrial sewing machine has to offer. If you can look past the qualifications for purchase, we are confident that you will enjoy what this sewing machine can do. Click here to look at pricing on Amazon and buy now on the Juki DNU-1541S. This leather sewing machine comes with a Sequiet servomotor so you’ll be able to get the job done quickly. The complete stand also includes K-legs so you’ll have a stable sewing experience. We loved the large bobbin capacity on the Reliable Industrial sewing machine, especially when combined with the link-type feed mechanism. This gives users a remarkably smooth operation that allows for consistent stitching for leather and other thicker materials. If you’re using this machine for other applications, then you can take advantage of its high speed applications as well. It will perform up to 2,000 stitches per minute so you can power out projects like never before. It’s heavy at 80+ pounds and the motor drive works flawlessly. You will need to watch the balance of the sewing machine and make sure it is properly oiled, but in return the Reliable Industrial sewing machine stands up to its brand name. We found that the heaviest duty leather sewing machine needles did the best job in creating a consistent stitch. Although other needles would also work, there could be some catching/snagging at times and you don’t want that with leather. From an industrial standpoint, this Reliable model is a rather basic machine. If you create a lot of leather products and need a commercial investment, however, this sewing machine will help you get your tasks done and still have plenty of time to spare. Click here to look at pricing on Amazon and buy now on the Reliable Single Needle. Are you ready to see what you could create with leather materials? Then you’re going to need one of the best sewing machines for leather that is available today? Use these reviews to find a machine that has the right features for your needs and then enjoy the beauty of creation!